It’s difficult not to walk around the Hyatt Regency Maui Resort & Spa without wearing a smile. Animal lovers, in particular, will be enchanted by the veritable petting zoo that resides on-property. Exotic birds take up residence on perches in the open-air lobby throughout the day, while African Penguins have their own enclosure where guests can watch them swim and interact with each other or be fed each morning by resort staff. Elsewhere on the property, there are flamingos, various species of swan, ducks, and cranes. All told, there are more than 50 resident birds belonging to 17 distinct species. Each seems to spend their days as leisurely as visiting resort guests, swimming, sunbathing or having nibbles. Guests can take in the sun on the sugar-sand Ka’anapali Beach, on guest room lanais, or at the oceanfront pool. Pool and beach cabanas are available for rental, or poolside guests can also take refuge from the midday sun by swimming into the popular grotto bar for a drink (it’s also accessible to walk-up guests not wanting to get more than their lips wet). The hotel’s location is another benefit. 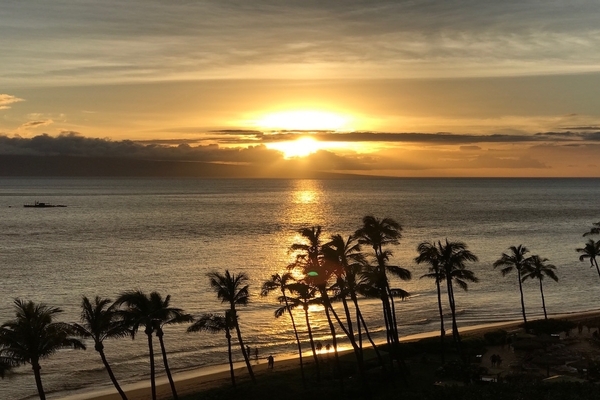 Located within the resort complex of Ka’anapali, it’s secluded on the far south end, with beach views down the coast toward Lahaina and of the West Maui mountains. Spectacular sunsets over Pailolo Channel and the island of Lanai take center stage during the early evening, and nighttime brings even better activity options. A must-do for any guest is the Tour of the Stars, offered multiple times nightly with the hotel’s Director of Astronomy, who specializes in Archaeoastronomy. That’s the study of not only the universe but also of how ancient civilizations viewed and reacted with the stars and planets they could see in the night sky. Perched on the roof on a clear night with three high-powered telescopes, guests can hear from an expert in astronomy who also explains how pre-contact Hawaiians viewed the heavens and used them for wayfinding during long ocean voyages. The resort is ideal for shorter stay guests who would like to include a luau in their activities. Many resorts in Hawai’i only offer luaus on select evenings, but the Drums of the Pacific Luau operates nightly, meaning shorter stay guests won’t risk missing the event like the might at properties with less frequent luaus that might not coincide with specific stay dates. Guest rooms are generously sized and updated in contemporary furnishings, with spacious closets and bath amenities from the on-site, beachfront Kamaha’o Spa. Step out lanais with seating and tables are a feature of all guest rooms, so the spectacular Maui environment is just steps outside each accommodation. Guests booking Regency Club accommodations can take advantage of multiple food and beverage presentations throughout the day, from full breakfast to evening appetizers and desserts. There’s also indoor/outdoor seating and a dedicated concierge to assist with guest requests and activities. For an enchanting dining experience with Pacific Rim influenced cuisine featuring fresh seafood, steaks, and sushi, guests can reserve a table at Japengo, which has a number of outdoor tables with wraparound views of the resort and waterfront. Definitely try the sushi. Mornings at Swan Court, where diners front a swan lagoon to enjoy with their breakfast buffet or a la carte order turn into gracious evenings at the fine dining Son’z Steakhouse. For lighter fare, there’s the poolside ‘Umalu with inventive cocktails and generous portions served under fragrant plumeria trees. Coffee lovers can get their morning fix at Honolulu Coffee Company or courtesy of their in-room coffee makers. To cap it off, there’s a noteworthy shopping arcade with everything from a convenience store to a small branch of Macy’s, Sunglass Hut, and a number of shops selling Maui-made and Maui-inspired gifts. High ceilings and heritage wood paneling reminded me of the period resort designs from my childhood – it’s comforting to know the resort has kept much of the original design elements intact through several decades of evolution. Maui is already a pinnacle vacation destination – the Hyatt Regency is a gracious, well-designed property that rarely feels crowded, even with every guest room occupied. All combined, it’s a great setting for a memorable, smile-inducing vacation experience. I’ve seen rates from around $299 per night plus tax. There are fractional ownership sales in progress on-site. Be sure to discuss whether a timeshare presentation is required for any offered activities, particularly those offered free or at a reduced price. Popular activities like the Drums of the Pacific Luau and Tour of the Stars can sell out in advance – resort concierges can assist with pre-booking prior to arrival. Accommodations were furnished by Hyatt Regency Maui in preparation for this story.